Good topic. I have my second ds and still say it is so much easier than gsd. Have had working gsd, and the difference is huge. Gsd is far easies to train, but more hyper. Destroyed everything and energy lvl were endles. Never settling down, always action. Shadowing me everytime and everywhere. Ds just sleeps. Sleeps. And sleeeeps inside, doesnt even bother to follow me at all. She is on the action when i say so but not without. Likes to cuddle, wont jump or nip me at all, never. Wont destroy anything, ever. Training is more difficult cause she aint so in for treats or even toys. Drive is also thing i need to level up everytime in training or it will stop. And my ds aint even showline, so i would say there are very much differences. If i would want to train ipo, i would get gsd for it. Its far easier. Ugh. I have my second ds and still say it is so much easier than gsd. I am trying to figure out if you are joking OR are the luckiest DS owner ever. I am guessing the luckiest. I admit they have high drives etc yes so has gsd. Yet i found ds so much easier in everyday life than working gsd. gsd when wanted to attack on something, went straight ahead, if I stopped behavior, started challenching me. also were VERY hyper, nipping hands when treating in training, biting, growling, jumping, very hard to switch off- button when turned on. Still, easy to train cause every treat worked like heaven, so did every toy. Motivation just kept on and on even doing the same thing many times. Still very hard even after training on the field for obedience and tracking and then jogging and ball play. hyper all day and jumping on even when u just lift a finger to get coffee cup. Awesome working dog though. and ds, coming along with me jogging, roams free nicely, when i am fishing, stays right by my side just watching doing nothing. Goes on the boat just napping. home just napping all time. car she naps. outside if I sit somewhere, she goes laying on the ground neverminding people around or anything. When training she has quite nice on off button and goes zero to hundred and back to zero. allthough when my gsds were all-people-take-and-train dogs, ds dont do things with other people easily even whith treat she always comes to me as to ask permission. She also wont so much like other people so wont listen to them. similarities there are but if u ask me, gsd is so much harder, for me it is. Likewise, all dogs have been guite boneheads and tough, I found ds much more submissive dog. we are training for nosework and tracking. ipo is hard cause we were testing if she has what it takes, and yes, might have, but she just keeps coming to me even the ipotrainer tries to do every kind of trick to get her to him. currently we are working with dogaggression, its number one right now so other things comes after she tolerates other dogs enough to get her training. While i write this, we are.... Sleeeeeping. My experience has been exactly the opposite of yours. I suspect that it might be a difference in the lines of the GSD I had. If you're dealing with European KNPV GSDs, I can see where there would be a difference. But, your description of GSDs exactly describes my Radar. Tell us about yourself: Hiya! I’m 36 yo, living in Ottawa, Canada. My baby Thor is 10 weeks old, and I had him for a week now. I’ve always been passionate about Shepherds, but the agility, intelligence, grace, and that brindled coat of the Dutch make my heart sing. Glad to see there is a forum for these magnificent dogs! Great piece of writing there, thank you! And i would surely buy that book if you wanna write it! I’m really glad I found this forum. I’ve had Thor for a week now and he is 10 weeks old, and i got all sort of activities/trainings planned for him. Keep the advices coming, and thanks again! There's a new puppy in the group! Welcome. this quote needs to be plastered on this front page. We have a very willful and stubborn german sheperd, but our KNPV Dutchy is on another level. I bring home boxes from the supermarket for her to chew during the day (that's her treat), as well as all the other chew toys in the house, and she just rips through everything like a demented chainsaw. Every day - without fail - she goes out and we train and run her all over the park - throwing balls, training, throwing, training - until we're exhausted! She comes home and just starts chewing through boxes and bringing over her toys to play with like she can do it all over again . . . There are two words in our house that get uttered (often shouted!) more than any other: "No!" and "Enough!" She has to be told to switch off. That's just an average day for us. If she doesn't get her own way sometimes, then hell hath no fury like a Dutchy! 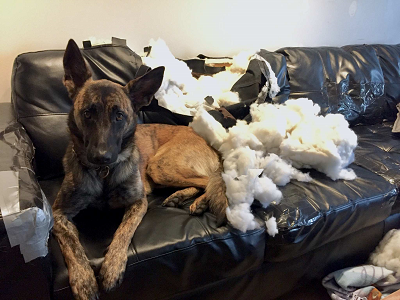 They work themselves up into such a state that if they don't get something to take their frustration out on, they will start to nip their handler in protest or re-direct their frustration at something you don't want them to (furniture, cushions etc). Direct confrontation is not the answer either - they will challenge you! Rather, you need to be firm and be prepared to teach them to divert that energy into something else: a chew toy, a tug, a ball, a sleeve - something to take their frustration out on. They really can be that intense! The flip side is, they are a very affectionate dog and will follow you anywhere just to be with you . . . or, you know, on the off chance you might like to throw them another ball or get the tug out (hint, hint!). They just need to work and they really need an outlet for their energy. They're also extremely intelligent and often try to get ahead of their owners, trying to anticipate what you want from them. You have to be very clear and consistent, otherwise they develop bad habits - and then you get frustrated! It's hard to describe what it's like owning a Dutchy. Love. Hate. Love. Love. Hate. Yeah, a bit like that, lol! I know my wife has a hard time with her sometimes, especially when the dog starts to back-chat. But I also know she's one of the best dogs we've had - in her own way! I guess owning a Dutchy is a bit like life itself: the more you put in, the more you get out. That’s wild, your dogs a unicorn. One thing I have noticed with my KNPV dog (Mal btw and a nutcase, he does have an offswitch on him hard to find some days LOL) is a weaker hunt drive than your average IPO bred GSD. I assume it’s due to there being no tracking portion of the KNPV test, all his other drives are extreme. But I don’t have a large enough sample size to state that conclusively. When people ask me how my GSD is different from my Mal. I tell them besides the energy & intensity, my GSD I order her to do something and she’s happy to do it if it makes me happy. My Mal... I’m just directing the chaos and trying to avoid a trip to the ER. Haha! I actually find my girl really wants to please - when it suits her! The main problem is she gets ahead of herself, so you really have to mix up the commands so she doesn't start picking up patterns and trying to predict what comes next. Often she will pick things up first time, and is a bit too clever by half. One example is the other day we were on the tug and I decided I knew just the incentive to make her out ("aus") quickly - I'd give her a ball reward! Sure enough, first time out quick-smart, but then she decided she didn't want to wait to be told next time - she just wanted the ball - so would drop the tug as soon as she had won it to get to the ball. Which kind of defeated the purpose. That's what it's like training a Dutchy - three steps forward, and trying to get her to take two steps back! But yeah, our german shepherd obeys, while our Dutchy sometimes stands there and thinks "What's in it for me?" She's better as she gets older, and she's best when it's crystal clear what's expected of her - but that's the human side of things. There is such a thing as having too much dog for an owner, and we have certainly felt like that at times, even with experience with working german shepherds. My ds is broken. She wont bring me toys or balls inside at all or jump or shadow me neither nips me. Even if i jump on the couch or do exercise, she just watch with one eye open, teeth hanging out, poking his feet in air, laying like that all the time. Sometimes i even checked if she is dead cause little over year old and energylvl is like an old turtle. Take her to the vet. You said in another post she had trouble with her back and was relieving herself in the house, which could be a sign of lower back or nerve injury. She may be in pain and reluctant to move if she has an injury. Don't wait until next month like you said - see the vet as soon as you can to ensure everything is OK. The things you are describing don't sound normal for a healthy young dog. We went to a vet, but nothing wrong seemed to be in her legs or movement. Healthy and kind dog they said. Maybe needing another, better harness, she might be just stuck and have muscle pains. Also relieving went away, seems to be she was just skitzo for her heat. Now she just marks everything outside and neighborhood dogs are grazy. Lol. Nothing wrong with this breed as a pet. Not all of them are owned by police or military so a lot individuals have experience with the breed. They are very loving, loyal dogs but require a lot of structure and time- which most people can't give them. They are fine around people if socialized properly. They should be trained in obedience at the very least- otherwise don't bother owning one. They have tons of energy so they won't do well if left alone nor without a lot of exercise but having more than one helps get them enough exercise running around the yard together. They can also do well at many other activities. Saw a Malinois on TV compete in a frisbee catching contest- the dog did great. What I figured out is that they are a very intelligent breed (Mal's and Dutchies being essentially the same dog) so it's more about interacting and learning a new activity that doesn't necessarily have to focus on just bite work. I was a first time Dutchie/Mal owner, now have three of these dogs. However now after seven years, I wouldn't own any other breed of dog. I now know who canine.karma.training is, started following him on IG presumably he was recommended as similar to Steve. Completely unrelated to this thread, randomly just saw the OPs quote on this page and the light bulb went off. Great trainer by the way. If y’all have Instagram I highly recommend you follow him. 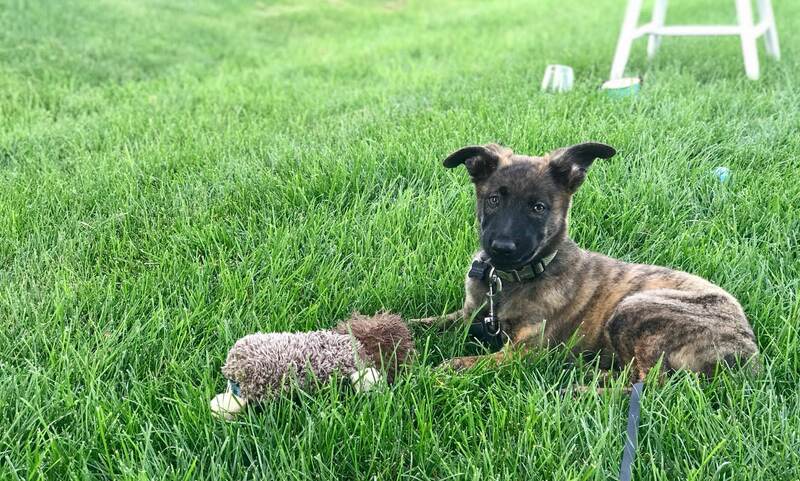 He feeds raw, he’s got an adult Dutchie who’s spectacular, and he’s got a Malinois pup 6 months old now that he’s been documenting a lot of his training very cool to see the progression. I’ve learned a lot of little tricks from watching his videos. Nicholas, what is the IG for this guy?